Along with the convenience of wireless networks, however, there is still always a concern of security since anyone with an internet-connected device within range could potentially access your network without your knowledge. When it comes to browsing the internet, speed is of the essence. Our first thought after setting up a wireless network usually concerns whether the signal is strong enough and whether its fast enough. While this is a considerably important concern, it’s best to make sure you have a fully secure wireless setup before getting lost in cyberspace. Here are a few tips to help make sure you have a secure wireless network. Admin passwords are easily figured out by attackers when they are left as the default. Not changing your wireless admin password opens your network to attack and can lead to many problems depending on the attacker’s agenda. Enabling WEP encryption on your wireless network will help you protect your privacy so your information won’t be picked up by a neighbor or random passerby with a laptop. It’s important to remember that all your devices on the wireless network will need to have the same encryption. So find the strongest encryption possible that will work on all devices of the wireless network. It’s a very good idea to install firewall software on all computers that will connect to your wireless network. Even if the wireless router comes with a built-in firewall, this extra measure can make sure that you block any intrusions that may compromise your wifi network or any of the computers you have connected to the network. It is best to position your wireless router close to the center of your home. 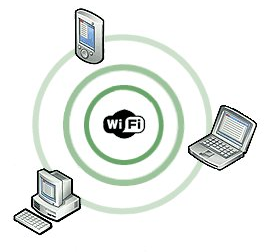 Although the reach of wifi networks can vary greatly, from model to model, it’s beneficial to keep the router near the center because it ensures that all areas of your house can have equal access to the network, as well as somewhat minimizing the risk of having outsiders access your router from a distance outside your home. These are just a few tips to help you make sure that your wireless network is as secure as possible. On the internet your privacy and security should be of utmost concern, and these tips can help you take that extra step toward maximum security. ‹ What are Cookies on the Internet?